Summary: Sometimes a man can be redeemed. But not in the way he expects. Jason Stafford is a former Wall Street hotshot who made some bad moves, paid the price with two years in prison, and is now trying to put his life back together. He’s unemployable, until an investment firm asks him to look into possible problems left by a junior trader who died recently in an accident. What he discovers is big – there are problems, all right, the kind that get you killed. But it’s not his only concern. Stafford has another quest as well: to reclaim his five-year-old son, “the Kid,” from his unstable ex-wife, and then learn just what it means to make a life with him. The things Stafford discovers about himself in the process are every bit as gripping as his investigation, and when the two threads of his life come together – the results are unforgettable. In BLACK FRIDAYS, the reader is introduced to lead character, Jason Stafford, the day he was released from prison after serving two years for a white collar crime. Jason was a Wall Street trader who perpetrated a scam that prevented him from ever again working as a trader or contacting anyone from his old firm. Jason was not remorseful about his crime and even had set up another scam where he divorced his wife, gave her half his assets to protect them from the feds and planned to remarry her after his prison term. However his drunken ex-wife wanted no part of him after prison which left Jason with two objectives- find employment and gain custody of his five year-old autistic son. Jason was hired by a small Wall Street firm to look into possible trading irregularities ahead of a threatened SEC investigation. This assignment put Jason in a dangerous situation that included multiple murders, life threatening actions and FBI involvement. At the same time, Jason had to get reacquainted with his son, had to learn as much as he could about autism and had to fight his ex-wife for custody. This storyline added a touching counterbalance to the fast paced world of Wall Street crime. It also provided a realistic look at life with an autistic child. Author Michael Sears did a great job in developing the characters of Jason and his son. Our hero Jason had several faults and was not entirely clean as he moved forward in his investigation. I felt that the other characters were a little predictable. Each Wall Street character possessed at least one of the typical characteristics we think of when we think of Wall Street: large ego, excessive drinking, fast talking, lying, dishonest or wealthy. The FBI agents were very unemotional and only focused on the job. His wife was a little too southern. The possible romance with a magician friend’s assistant didn’t really add much to the story. Sears was certainly more than capable of writing about white collar crime and securities trading after spending more than twenty years on Wall Street. Some of the investment talk was a little difficult to follow but did not detract from the story. BLACK FRIDAYS is a story about high finances and high risk. It is an easy to read enjoyable thriller that includes a touching father-son story. 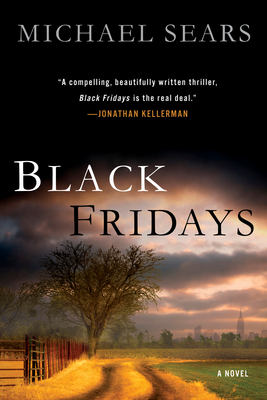 Anyone who enjoys a good thriller will like BLACK FRIDAYS. I'm not big on these kinds of thrillers, but one of my brothers is. These kinds of thrillers don't please me most of the time, but my mom might enjoy this one. Jason sounds like quite a character! I'm not sure I'd understand all the financial ins and outs of the book but it sounds good to me.